This addon provides a status panel with useful information for certain bosses in the Veteran version of Halls of Fabrication. This addon is particularly useful for tanks and raid leads. Displays the current health percentages of both bosses, so that players don't need to install one of those bulky combat UI overhaul addons in order to keep track of the relative health of the bosses. Displays the severity of the Scalded healing debuff, and if the debuff is active, the time remaining on the debuff. The Scalded healing debuff increases in strength based on how long you were in the steam and can range from 10% to 100% (at which point you cannot be healed at all). This feature will let you know the current strength of the debuff on you. Displays the amount of time that last elapsed since the previous Simulacra (split) mechanic. Splits happen approximately once every 45 seconds, but the timing can vary; in particular, overlap of mechanics can cause a significant delay in the split mechanic. Notifies a player if it detects that a Simulacra and Centurion Hammer strike are about to strike that player at around the same time. Unfortunately, the amount of warning given is usually less than a second before it becomes too late to react, and there is no way to know and to warn of this any earlier. Displays the current health percentages of all three bosses, so that players don't need to install one of those bulky combat UI overhaul addons in order to keep track of the relative health of the bosses. Displays the amount of time that has elapsed since the start of the previous Overload/Overheat channels. The Overload/Overheat channels (aka, the boss 4 tank swap mechanic) happens approximately once every 30s. The exact timing varies slightly (more so if it happens to coincide with a boss stun). 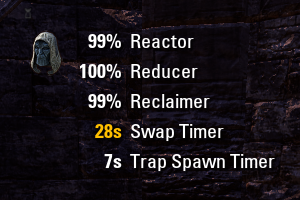 The timer is reset to 0s at the start of the swap mechanic. So seeing that the timer has reset means that the swap mechanic is currently underway, which can be helpful for the times when the visual effect is obscured by other ongoing combat effects. Knowing that swaps happen approximately every 30s, players can also watch the timer to know when the bosses are nearing the start of the next swap mechanic. By default, the timer is visible only if you have the tank role selected and/or if you are the group leader. This can be overridden by typing the /hofntimer timer into chat, which will show the timer even if you are not a tank or group leader. 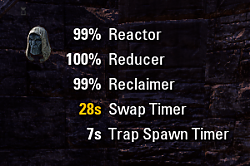 Displays the amount of time that has elapsed since the start of the previous trap spawn channel by the Reactor. Traps spawn approximately every 30s, but the timing is variable and can vary in either direction by a few seconds. This should help groups better coordinate when to bring the bosses in for a stun. Notifies of the start of the Exhaustion debuff in execute and displays the current stage of the debuff and the number of seconds spent at the current stage. This debuff is the cause of the increased incoming damage late in execute, and once it is applied to the group, it will increase in strength every 15 seconds. Since each stage of the debuff lasts 15 seconds, if, for example, you see that you are 13 seconds into the second stage of the debuff, you will know that the third stage will hit imminently. This may help groups that use mitigation ultimates to better plan and time their use. The display will automatically appear once you are within range of the relevant boss (e.g., once you enter the room), and it will automatically disappear when you leave. The position of the display can be changed by simply dragging it around with your mouse. Just had a run today where one of the splits took place 57s after the previous. Not sure what causes the variance in timing, but that variance plus the question of "What would we do differently if we knew a split is coming in the next 10s?" makes me doubt that this would be worth adding. It's not so much what the tank would do differently. Rather, it's what the group would do differently. If we know that the simulacrum is coming, then the group can hold back ultimates (specifically, the lightning destro ult) for a little bit. That particular ult has a lot of particles and can make it difficult to see the shades. I admit that come Horns of the Reach it probably wouldn't be as useful anymore though. Fair enough. I'll look into adding this to a future version. I didn't want to delay version 1.2 for it, since I wanted to get that out before tonight's raid. No problem, I completely understand that, and I've almost certainly done similar things before. Last edited by code65536 : 07/25/17 at 02:50 PM. The first field is the standard Unix-style timestamp in seconds. The time between splits varies from 43 to 50s, averaging 46s. It should be pretty easy to add a timer for this, but I am not sure what groups would do with this information, since as a tank I don't think there is anything that would do differently if I knew that a split was coming soon. Last edited by code65536 : 07/25/17 at 11:24 AM. Would it also be possible to add an approximate timer for the second boss' shade mechanic? If everyone can see it, that would be ideal, but even if only the tank can see it, it would be helpful.